Have You Chosen Your Wedding Venue Yet? Luxurious, elegant, lavish and extravagant – do you want your guests screaming these words at your luxury wedding venue? Throughout London there is no shortage of wedding venues, but when it comes to finding a luxurious one that ticks all the boxes, your search becomes that little bit harder. 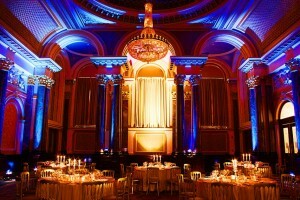 Well, now you can stop looking, as I bring you my top three, luxurious wedding venues in Central London. Gibson Hall is located in the centre of the city and is bursting with character – you will instantly fall in love. Built in 1865, the building is so rich with classic architecture, featuring Corinthian marble columns and three stunning crystal chandeliers. Head through to the Garden Room to find a bright and airy space, that focuses on the spectacular garden area – ideal for a summer wedding. The room looks like a photograph, pulled straight from a magazine. If you have not heard of Syon Park, you must be living under a rock! Syon Park is known worldwide for Robert Adam’s most famous Neoclassical designs. The main focal point of Syon Park is the Great Conservatory, also known as a glasshouse. The inside of the conservatory is absolutely breathtaking and you’ll be taken away to another place, as you stare up and get lost in the clouds. Not only is it a popular choice for couples, but many celebrities choose to say ‘I Do’ at this stunning venue. Last but not least, is the beautiful Orangery Room at Kew Gardens. It is easy to wander off into your own world, as you venture through the enchanting gardens and stumble upon the striking Orangery Room. Built in the 18th Century and featuring high ceilings with grand arched windows, you will want to dance the night away under the stars. I could go on for days naming our other impressive, luxurious wedding venues that we look after here at The Perfect Wedding Company, as the list never ends. Make sure that when it comes to planning your big day, you view these stunning venues as they will not disappoint.